As expected, yesterday saw little action from the riders currently seated at the top of the general classification, but fireworks are certain to be ignited on today’s unique stage; tailor-made for combative riding. The final two days in the mountains at this year’s Tour de France are unique for their short distances and large amount of testing climbing squeezed into such a limited period of racing. This type of stage structure is meant to instigate fighting amongst the favourites throughout the day, as the need to stay fresh is minimised by the lesser total distance, aiming for a battle royale to decide the maillot jaune’s owner come the podium in Paris. Despite Chris Froome currently leading the race by more than three minutes, he and Team Sky are sure to be unsettled by the prospect of a day which will encourage his rivals to lay everything down ahead of tomorrow’s ride to Alpe d’Huez. 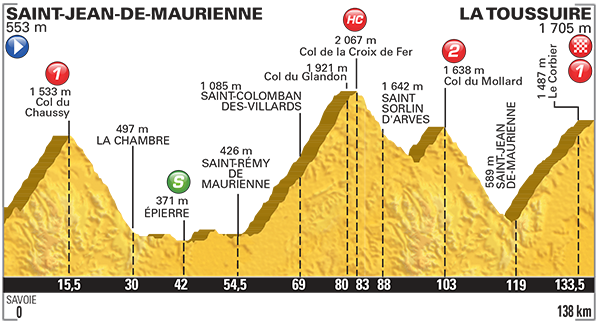 Beginning in yesterday’s finish of Saint-Jean-de-Maurienne, the riders will only have to cover 138km to the finish of La Toussuire; a journey encompassing a HC climb, two Category 1 climbs and one Category 2 ascent. As soon as the peloton begin rolling out from the day’s start, it is immediately an upwards gradient which faces them, opening with the 15.4km long Categroy 1 Col du Chaussy (avg 6.3%). A familiarly Alpine technical descent then follows down from the summit, lasting 15km and placing the riders back on level ground for 25km, this includes the relatively easy intermediate sprint after 42km. By around 60km worth of riding, the peloton will have the realisation that not a single passage of flat road now remains from here to the finish atop La Toussuire. The bulk amount of climbing starting as they begin ascending the HC Category Col de la Croix de Fer, a brutal challenge lasting 22.4km which averages a deceptive 6.9% gradient. Misleading, as it fails to hint at the 8km run of 9% – 10% gradients which begin after approximately 12km of climbing have already been tackled by the riders. It eases near the top, but the damage will have already been inflicted by this point, offering us an insight as to who looks strong and which favourites appears isolated already. Off the Col de la Croix de Fer comes another technical descent, but one which interrupted by the day’s sole Category 2 climb, the Col du Mollard. Lasting for only 5.7km and averaging a 6.8% gradient, it is situated here to upset the rhythm and interrupt the possibility of ample recover as they drop back down into the valley ahead of the day’s final climb. From the top of the Col du Mollard, only 35km remain to decide the outcome of this crucial Stage 19 battle for the yellow jersey; nearly half of which is yet more descending. The 119km marker signals the start of the climb to the line, the Category 1 La Toussuire placed to act as the backdrop to a fierce battle between the general classification frontrunners. A total of 18km hauls the riders up to the ski resort atop the climb, averaging 6.1% from bottom to top and is not immensely difficult once the harder opening 4km (6% – 9%) have been completed. However, in context of what has preceded it on the day, it is sure to see many riders crack under the mounting fatigue of an intensely explosive race to La Toussuire; even with an easing finale few kilometres at the top. Movistar have to roll the dice here, as waiting until tomorrow’s ascent of Alpe d’Huez is unlikely to inflict big enough damage to see Chris Froome lose his lead on one climb. They currently have two riders sitting second and third on the general classification, but this is a curse as much as it is a blessing for the Spanish team. Though with Nairo Quintana and Alejandro Valverde a potent pairing to disrupt Chris Froome’s lead, those within the team will have qualms about investing too heavily in attacking Froome and seeing Valverde crack as a consequence with a strong Geraint Thomas poised to swoop onto the podium late into this Tour de France. Tactical headaches are plentiful throughout the peloton on a day which could see as much chasing from those attempting to cement top ten placings, as much as the battle for the maillot jaune itself, though Movistar are sure to have the hardest time deciding their strategy out of everyone on Stage 19. Having attacked Chris Froome in small doses thus far, many are expecting Nairo Quintana to give Stage 19 both barrels and put everything down on the ride to La Toussuire in an attempt to finally break Froome’s stranglehold upon the yellow jersey. The Colombian is clearly in great form and there is a feeling that we have not really seen him attack with a 100% intent so far, marking him out as the biggest threat to the current yellow jersey owner. Quintana may wait until the final climb to attack hard, but will need to make the most of the tougher gradients, as the easing summit will only go to favour the faster finishing Chris Froome on such inclines. There is a chance that the Movistar leader might even attempt to attack long range, laying down a marker on the Col de la Croix de Fer in an attempt to find allies in Vincenzo Nibali and Alberto Contador to really force Team Sky into a tactical nightmare. On recent evidence, Chris Froome is the best climber at this race so far, but he is notorious for ailing somewhat as a Grand Tour approaches its final days in the mountains. Not only this, but his team has not been firing on all cylinders as of late, with Geraint Thomas often the only man left to protect him late on in the race. Today’s ascents do not suit Froome as well as they do his rivals, making it likely he will ship some time if he is not on the wheel of Nairo Quintana in the final 5km to La Toussuire. However, if he is still in touch with his rivals as they duck under the 5km to go banner, he will be the favourite to win the stage on a softer gradient which allows him to spin up to speed and beat those around him. Movistar will be eager to cement Alejandro Valverde‘s position on the podium after yesterday’s stage saw him wobble and display the first significant signs of the 35 year old Spanish Champion cracking. Their worries will be justified as the long and grinding ascents of Stage 19 will not favour Valverde at all, possibly tipping him over the brink and conceding his podium place with only Alpe d’Huez available to save it. Valverde could try to anticipate this and join an early breakaway to cushion him to the battle behind, he is a talented descender and could lean on this to establish a lead; even if this fails he will act as a stepping stone for Quintana should his teammate catch him. If the tempo or fighting is not as intense as expected, possibly due to torrential downpours during the day, then Valverde has a chance of being in the lead group approaching La Toussuire where he would be favourite to win any such sprint for the line. Alberto Contador and Vincenzo Nibali enter the day with the need to save their race after disappointing showings which scuppered their chances before the real battle and even been ignited. The former could be tempted to launch a long-range attack off the Col de la Croix de Fer, something which he has utilised before in such situations in an attempt to recoup his losses late in a Grand Tour. The Italian Nibali is able to employ exactly the same attack, knowing he will be allowed to join a breakaway group given his current placing and is strong on a day consisting of so much descending; though his climbing form has not been consistent. The battle for the Polka Dot Jersey is now the most hotly contested battle at this year’s Tour de France, a factor which should lure Joaquim Rodrigeuz, Romain Bardet, Rafa Majka and Jakub Fuglsang into a level of action as the biggest names present in the fight for that competition. In a breakaway, the likes of Pierre Rolland, Rigoberto Uran, Dan Martin, Steven Kruijswijk and Thibaut Pinot are just some of the strongest riders left to drive a break right the way to the line. Such a short stage is bound to instigate an intense and widespread battle to gain a foothold in the day’s breakaway, of which could comprise a large array of riders including those desperate to save their general classification places such as Alejandro Valverde or Alberto Contador. Regardless, the big showdown should be between Nairo Quintana and Chris Froome, but where that fight shall occur could vary considerably. The Colombian is the favourite to win here, but if he has not shifted Froome ahead of the final kilometres to La Toussuire, then the Sky captain as a strong chance of taking another summit victory. Posted on July 24, 2015 by Spokenforks	This entry was posted in Le Tour de France, News and tagged Alberto Contador, Alejandro Valverde, Chris Froome, Dan Martin, Jakub Fuglsang, Joaquim Rodriguez, Nairo Quintana, Pierre Rolland, Preview, Rafal Majka, Rigoberto Uran, Romain Bardet, Spokenforks, Stage 19, Steven Kruijswijk, Thibaut Pinot, Tour De France, Vincenzo Nibali. Bookmark the permalink.